If you like to trade in Nifty or Bank Nifty only and wants timely entry and exit in your position. So along with technical analysis Option data can help you to find the proper trend of underlying index and increase your ratio of successful profitable trades. 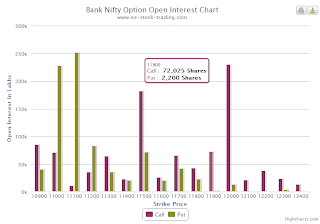 Examine the Option Open Interest data of the banking index (Bank Nifty). With following visualize chart you can track the highest open interest build up and changes in open interest of most active call and put option. Bank Nifty is the index of top Indian banking companies traded in the Future and Option segment on National Stock Exchange of India. 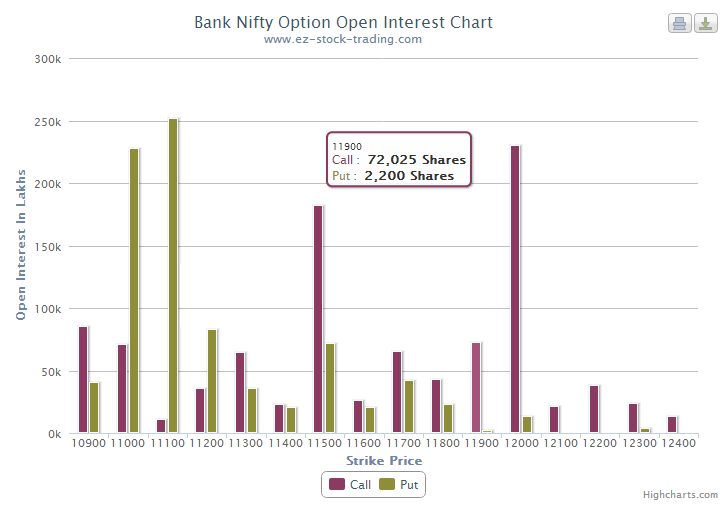 Bank Nifty index is the index includes 12 most liquid and blue chip stock traded on NSE. Pulse of the economy, CNX Bank Nifty captures the performance of Indian banking system in to the capital market for investors and traders. The index is a free float market capitalization weighted index with base date of January 1, 2000 indexed to a base value of 1000. Selection of the Bank Nifty Stocks is based on the following criteria. Company's market capitalisation and turnover rank should be less than 500. Company's trading frequency should be at least 90% in the last six months. Company should have a positive net worth.